The Lesser North American Bed Monster is a highly specialized beast with a singular appetite for that warm spot in the middle of the bed. Using its highly sensitive tentacles, the bed monster carefully feels its way through the dark under the covers until it finds just the right spot. 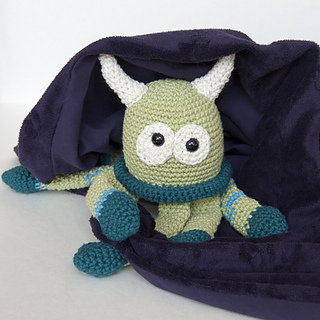 But the monster’s adaptations to its heat-seeking lifestyle aren’t limited to the tips of its toes… Two horns atop the monster’s head allow it to tent the sheets as it travels, providing ventilation and allowing it to use its large eyes to see in the dim light. 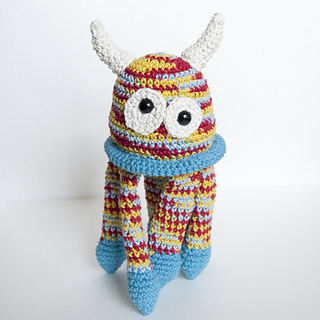 This pattern uses a size F crochet hook, fiber fill, 12mm eyes, and Knit Picks Dishie yarn (or other worsted weight cotton yarn), Exact yarn color requirements are detailed in the pattern.